Current regulated: those light fittings usually accept a wide range of supply voltages. Unregulated: the light must be operated close to a nominal voltage only. In order to operate safely and efficiently, a LED chip needs to be supplied with a constant regulated current. Over-current will cause heating and drastically reduce the life of the device, or even destroy it. 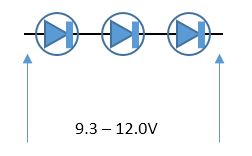 When a white LED is operating at its optimal current, the voltage at its terminals ranges between 3.1V and 4.0V typically. The key point to understand with LEDs is that you can’t decide the supply voltage and obtain an acceptable current: you have to control the current and accept the resulting operating voltage. This is because voltage and current are coupled by a relation that is highly non-linear and very sensitive: a tiny variation in supply voltage results in a large change in LED operating current and this relation also depends a lot on temperature. Since the current determines light intensity and safe operation for the device, current must be controlled. We need to lose 12.6V – 10.2V = 2.4V over the resistor for a current of 300mA, so a resistor equal to 2.4/0.3 = 8 Ohms can fit the bill. 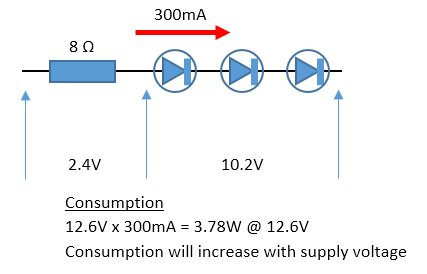 The problem is that current will vary with supply voltage and the light is inefficient: here 2.4 / 12.6 = 19% of the energy consumed is wasted as heat in the resistor. If we now start the engine and the alternator kicks in, putting out 14.5VDC for a while before dropping back down, our LED current increases very significantly. Assuming the LED voltage drop at that higher current would now become 3.6V, the current would reach (14.5 – 3 x 3.6) / 8 = 462mA. An increase of 54% over the nominal operating point will clearly be damaging over time. Using two LEDs only and a larger resistor would make a light more resilient to voltage fluctuations, but also more wasteful for two thirds of the light output only. While very simple and very cheap, such LED lights are not really satisfactory on a yacht where battery voltage fluctuates quite significantly. The answer is replacing the resistor with a circuit that limits the current by converting the supply voltage down to the exact value required to obtain the desired current. Such a circuit is known as a Buck converter. Buck converters can be about 95% efficient. 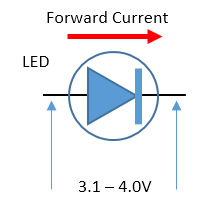 In this case, the higher the supply voltage, the less current the light draws, because the Buck circuit converts the power down to the voltage required by the LEDs. Conversely, current-regulated LED lights don’t grow dimmer when battery voltage drops, they just absorb more current at a lower voltage to cover their energy needs. One should only use current-regulated lights on a boat due to the large fluctuations that take place in the supply voltage. 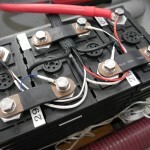 Unregulated lights tend to deliver uneven performance and poor lifespan if used during battery charging. If energy efficiency is a consideration, like when living aboard, then consumption is another very good reason to use regulated LED lights because they waste very little energy.